#VIXIndicator Because I’m becoming an Excel geek, I made a new chart measuring a performance metric for the Upside Warning. This shows the rise we have gotten from past Upside Warnings in relation to how much the SPX had already recovered before the Warning hit. 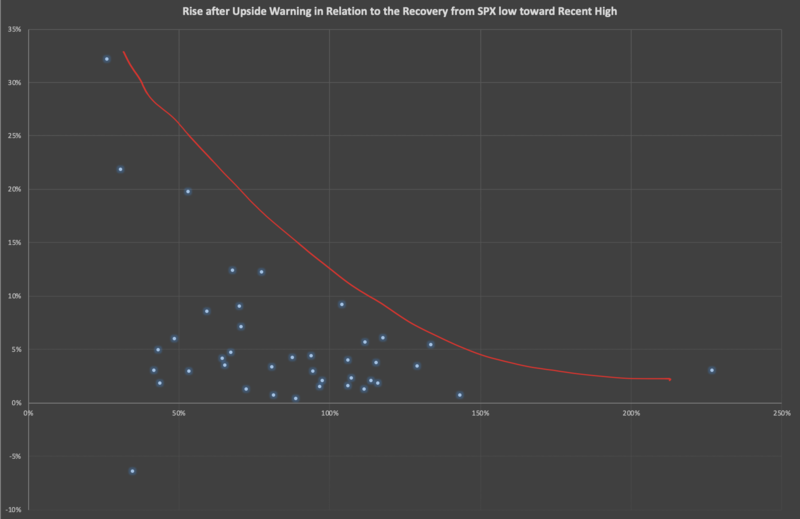 For instance, the upper-left-most dot represents a 32.2% rise in SPX AFTER the UpW; the UpW hit after SPX had recovered only 26% of its drop (horizontal axis). I drew the sloppy red line showing the general trend: the less we have recovered from the correction when the UpW hit, the higher we can expect the rise to be after the UpW. Although the red line shows a trend, you can see that most are clustered in the same general area. And for comparison today, we had recovered 65.5% at the close yesterday, when the UpW hit. (high 2940, low 2351, 20% drop. Close yesterday was 2737, which means we regained 65.5% of the drop). very interesting. so a 5% move higher would be quite likely? Not only an Excel geek but more importantly our Bistro guru. Thanks for sharing your work product.